Get a FREE Arc Fault Breaker! With the installation of any new circuit breaker panel, you will receive a FREE Arc Fault Breaker, designed to prevent fires by detecting a electric arc and disconnecting the power before the arc starts a fire in your home. Simply mention this “web special” when contacting us to receive a FREE Arc Fault Breaker. “Smoke alarms, fire extinguishers and escape ladders are all examples of emergency equipment used in homes to take action when a fire occurs. 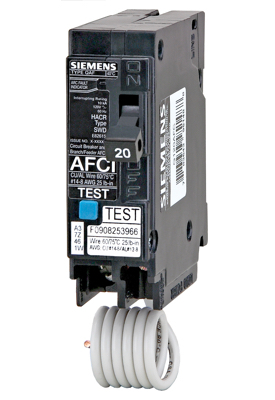 An AFCI is a product that is designed to detect a wide range of arcing electrical faults to help reduce the electrical system from being an ignition source of a fire.